Fabulous flowering yard with deck for dining and lounging and hot tub and kids playhouse and fire pit and private outdoor shower. Lots of green space too and blueberries to pick! Beautiful 4 Bedroom Home at 746 North Shore Drive in South Haven. Steps to Newcome Beach. Close to Downtown. This classic American ranch home is one of the reasons North Shore Drive is so popular for vacation rentals. The location is superb with Newcome Beach on the sandy shores of Lake Michigan close by, north side beaches and attractions just down the street, downtown shopping and dining just across the bridge, and lots of what makes our area so awesome just a short drive away. The home's outdoor space is one of our best with something always in bloom in the gorgeous gardens and blueberries for picking in season. 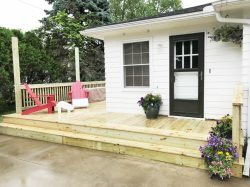 A playhouse for the kids, complete with electricity, plenty of lawn for yard games and a tiny woods with trails are all in sight of the large deck and patio. The hot tub, hot/cold private outdoor shower and fire pit round out the backyard features. Perfect for families with or without little ones! The interior is spacious and inviting with a separate family room and living room on the main level. The finished lower level has a large playroom for the kids, a bar with sink and fridge, plus a full bath. Four bedrooms on the main level and sleeping in the lower level provides sleeping for twelve guests, all in beds. The perfect summer spot! Bedroom 2. Main Level. King. Bedroom 3. Main Level. Twin and Twin over Full Bunk. Bedroom 4. Main Level. Full Murphy Bed. Additional Sleeping Lower Level. Queen Memory Foam Sleeper Sofa and Full Futon. Bathroom 2. Main Level. Half Bath. Bikes. Please bring helmets. Plus a Bike Rack. We stayed there in June of 2017 for a long weekend. Perfect getaway for a girls weekend! Close accommodations to the beach...short walk from town...perfect for a fun run on the beach in the am. The house has a beautiful backyard that is great for grilling and catching some rays,) there is a hot tub available, although we didnt use. Kitchen was well equipped with everything you need for simple to gourmet meals. Bedrooms were comfy. We give this top notch 4 star rating and would be happy to return! Great location, clean, and great for kids! We had a great week with the family!